Blogging returns to this website after my family had a great visit to New Mexico. 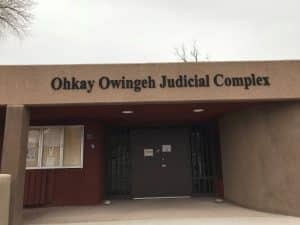 The first picture here is the Ohkay Owingeh Judicial Complex/ courthouse at a pueblo only a few miles north of Española, as we headed to Bandelier from Taos. This being Sunday, the courthouse was closed. As a Fairfax criminal lawyer, I do not need to practice in tribal courts, as the closest such courts to me are in New York state. Nonetheless, I am very interested in Native American rights and sovereignty, and am obsessed with the protection of criminal defendants’ rights in all courts. 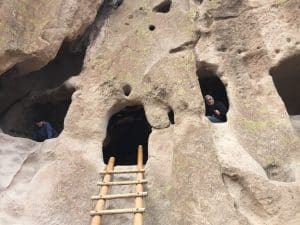 Pictured at right is a photo of me and my son (taken by my wife) inside one of the former cave dwellings, at Bandalier National Monument. Bandalier is a great place to visit for these caves and the majestic surrounding mountains. Bandalier is west of Taos. Bandalier is a close drive to Santa Fe, which is southeast of the monument. Mexico is bursting with culture, beautiful art, and architecture. 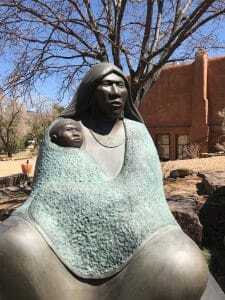 One of the great artists I encountered there is the late Allan Houser, who created such beautiful sculptures as his mother and child pictured to the right, which on Santa Fe’s main art gallery road. You will find more photos from my trip on my Instagram page. The world does not stop when on vacation, while a good vacation helps slow down the pace of life before returning with recharged batteries to the ever-busy courthouses and criminal defense clients rearing to go on the next steps in their cases. This week I spoke with a very good fellow lawyer, who had returned from a Spring break vacation and was yearning to be back on his trip. While a good vacation can bring a certain enjoyable quiet that many do not want to interrupt, meditation and other mindfulness practice can help ease one’s daily out-the-door criminal defense work into a more powerful practice, which can benefit from something as simple as at least five to fifteen minutes of mediation early each morning, to help handle the day’s upcoming curveballs and other challenges. Blogging returns to this website. Fairfax criminal lawyer Jonathan L. Katz has successfully defended thousands of criminal and DWI clients since 1991. To discuss your case with Jon, in confidence, please call his staff to schedule a meeting, at 703-383-1100.